I had a break up. I’m not gonna lie, it was kinda serious. It’s hard when you finally realize something you have been living for is not going to work out. All the dreams you had are just…gone. The relationship was dysfunctional. Full of mocking and chiding. The break up happened a while ago, but only now am I able to really talk about it. But, I’m ready now. My wounds have begun to heal. I officially dumped all my “5 pounds from now” clothes. I know all you ladies know what I am talking about. These are the clothes you hang on to because you remember looking and feeling great while wearing them. Clothes you bought because you couldn’t fathom buying the dreaded size up. Clothes you swore that you would get into after you did your “detox”. And let’s all be honest…we know that they aren’t really “5 pounds from now clothes”..they are more like 10, 15…pounds from now clothes. AND we all know that if we DO get down to the weight where those clothes fit we’re gonna go buy new stuff! Because there’s nothing better than shopping for skinny clothes. In hindsight I should have done it a long time ago. I watch Oprah everyday..I know all the warning signs of an unhealthy relationship, but when you are knee deep in size 6’s you just don’t want to let go. But I have and you can too. Trust me, time heals the wounds. 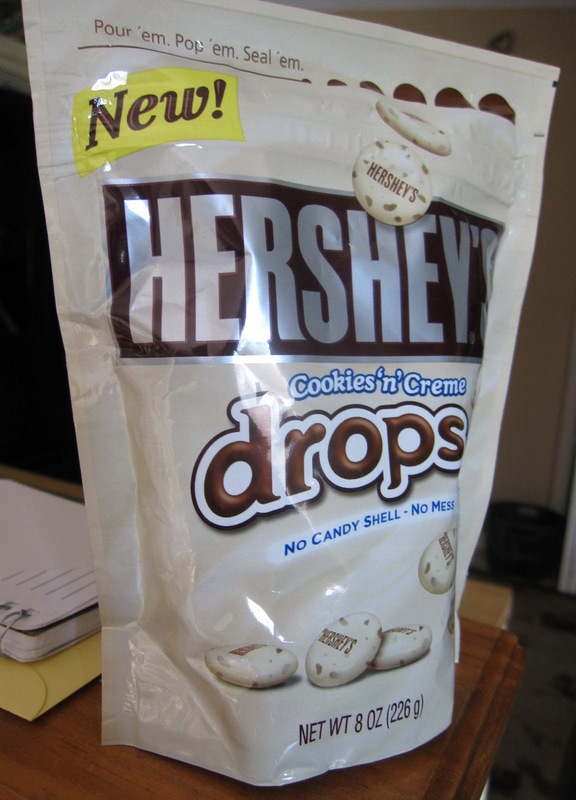 I used these…Hershey’s Cookies and Creme Drops..
Happier, because now I have space to go shopping! Shhh, don’t tell my husband! Take my lead sisters…get rid of those dumb clothes. Buy clothes for NOW, because you’re all gorgeous! 1/2 cup dark cocoa powder (I used Hershey’s Special Dark), but if you don’t like dark, just use regular cocoa powder. Cream together butter and sugar until fluffy and light. On low, slowly beat in cocoa powder until well incorporated. On low mix in your remaining dry ingredients (flour, baking powder and salt). 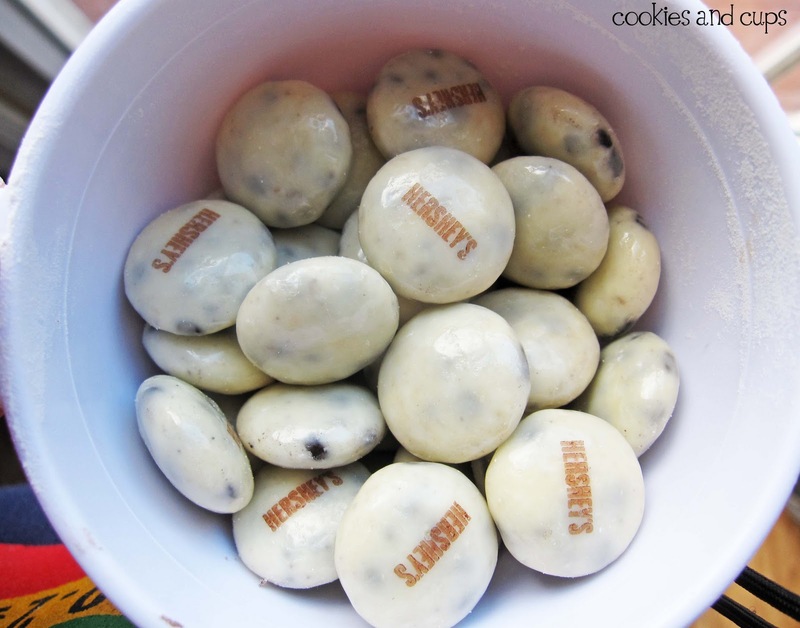 Fold in you Cookies and Creme drops and chocolate chips until evenly incorporated. Drop by large tablespoonful on a parchment lined baking sheet. I recommend under baking these. So bake for approx 12 minutes or until edges are set. When done baking let cool on baking sheet for 2-3 minutes before transferring to wire rack to finish cooling. so, i went through a breakup that was pretty rough and through me into turmoil earlier this year as well. i understand the moment of healing, the moment of letting go, and understanding. i commend you for reaching that point, for going further and cutting all the rest of the unhealthy from your life, and for being positive through it all. thanks for sharing not only a great recipe, but a truly touching and motivation piece of your life. I love this post! You are so right and I have also recently done this. I work everyday at trying to just get through one day , not overeating- learning to listen to my body and ask myself if I am really hungry. It's hard when baking is one's form of relaxation and fun, but I am learning to give away everything that I make. Also learning to love myself as I am and live for the day. Thanks for a great post and some amazing looking cookies!! Oh my goodness. Those drops are going to be the death of me. and I Purged my clothes recently too. No sense in looking at them anymore. Too depressing! Oh Em Gee these look amazing. If only you hadn't posted a pic of them cut in half, my willpower might have reigned me in. BUT NOOOOO. You had to go and expose the yummy delicious center. I mean, I WAS on a diet. I have to do that!! I need to purge… but then I start to sort and it makes me sad and slightly mad at myself that these clothes I once thought of as fat clothes are now my skinny clothes and I end up with a slice of pie and a glass (or bottle) of wine having my very own brand of pitty party! It's not cute… therefore I put off the break-up and live in the disfuntion… maybe I need to try again?? Congrats on that break-up!!! I honestly should do the same… I have clothes that I haven't warn in years hanging in my closet JUST IN CASE I should ever be that thin again…. Not sure why I torture myself like that when I'd much rather be able to enjoy delicious cookies like this from time to time! Love, love, love! I tried to do that this summer, but there is still a pair of capri pants from Banana Republic hiding back there. Must ditch them….and eat these cookies! I don't like keeping clothes that don't fit. There are no happy thoughts, they are just sitting there staring at me. I'm with you DUMP them! Funny thing is I really don't think happiness is one size smaller, it's often too much pressure! This is one of my FAVORITE~all time post EVER! And I mean EVER…on any blog! Those CHOCOLATE delights are worth every INCH! Totally worth giving it all up for! I have small/med/large clothes…I must keep them my wirght is all over the map…these looks so super tasty. first off, those look DELISH! second– i agree with you! those clothes are just there to taunt you. who needs that negative energy? Oh I know those 5lbs rom now clothes. I have a bin of them but the weight loss is actually 10, 20, 30 pound clothes from now. aye yi yi! One day I will get your courage and dump them, but for now I will stare at them longingly while I eat a cookie. I'm thinking I need to head to target because they are the only place I could even fathom finding these cookies and cream drops of which you speak. And maybe while I'm there I'll pick up a pair of jeans a size up…cause that's what I'll need after I eat a batch of these! Anyway, I of courses am copying this recipe, just not making it quite yet! Yum! 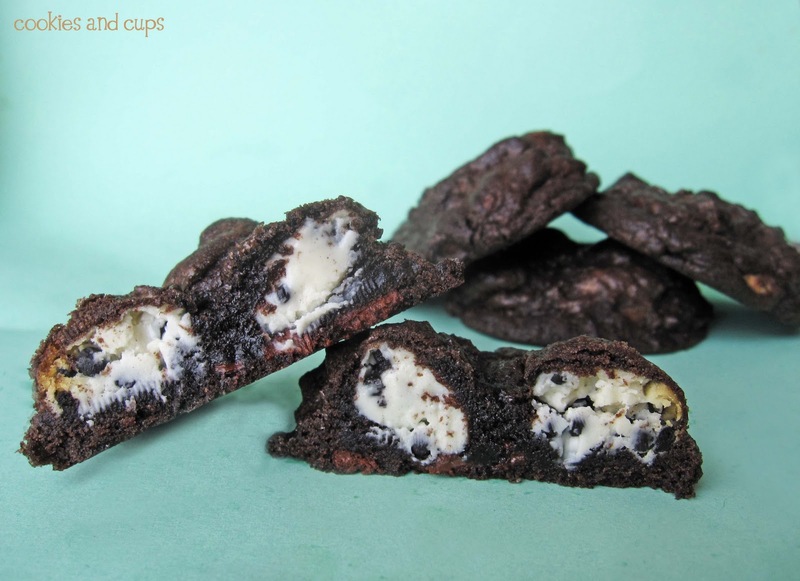 I have those cookies and creme drops in my pantry and need something else to make with them. I added them to the top of some treats I made a few weeks ago too. Oh my. Well, if I thought I could hang on to those "5 more pounds" clothes anymore, I won't be able to after I give these a go! They look utterly irresistible! OMG. These look amazing. I'd honestly rather buy bigger pants and eat these cookies!! Skinny jeans are overrated anyway (I hate them!). Those cookies n cream bites looks so good! I must get my hands on them soon. And just a quick comment: I'm happier being able to eat sweet and be a few pounds heavier than I like. Sweets make me happy! I may have added 5 pounds just by looking at your cookies! So what you are telling me is that I should throw away my hot pink, size 6 jeans that I have not fit into in about 15 years?…lol It stinks to get old but I will feel much better eating these cookies. They look amazing. I hope I can find those C&C drops. Unless of course, you are pregnant. And then you probably shouldn't be throwing out all the clothes that don't fit. Just saying. But if you are pregnant, you will probably need to eat at least twice as many of these cookies. Sending you all the love and Support I have. Be true to yourself! That is all you can do! 🙂 We love you! It is nice to see you posting again! Love this post 🙂 Tight jeans and chocolate > no chocolate and skinny jeans. I am on a quest for those cookies and cream bits! I think I just fell in love with you. Yes…the message in the post is great, but it's not that. These cookies…it's like you climbed into my brain to make my dream cookie. I cannot wait to make these. I think I need to add you to my crush list now! This is too funny. I think half my closet is full of those clothes! I guess its time for some spring cleaning, thanks for the motivation and emotional assistance in getting over the fact that my hips will never reeally fit back in those jeans! Anyways…I love those Hershey's drops, my husband calls them the lazy version of Hershey kisses, great idea to bake them in cookies, thanks! I'm sorry to hear your relationship didn't work out – but hey, you're better off without that negativity in your life. Plus, it's a great thing to hear you're moving on and fine! As for your cookies – they look like a great success and my friend and I are drooling at them. I need to buy a bag of these when I get to the states! Everyone deserves a delicious cookie–and deserves to stop thinking about that weight for a while! I'm afraid I have yet to face this cold, harsh reality. I sure could use the closet space though! Food blogging- especially DESSERT blogging is dangerous to your waistline! Fabulous, delicious-looking cookies, nonetheless!! I made fudge with those Drops over the holidays. And your cookies look divine, whether I fit in my current pants or not! How bout little bittly shorts youwore in high school? SHould those go too? ha! These look yum. I love white chocolate in a dark chocolate cookie. OMG – that candy looks to die for, notice I didn't say to diet for I want some now! and the cookies you made with them YUM. Good work with the break up, be happy and healthy and the way you were made. Thanks for an awesome post! I featured it on my blog — Today's Top 20! Smile. Amen, sister! I am getting rid of some of my too small clothes too…and I'm certainly hunting down those hershey drops. Yum! Thank you for sharing your heart and these treats. I hope you have a blessed Saturday! That picture of the cookies got me immediately. These are going on my want to make list. They look so good. I have not seen those Hershey's bites. I will need to try them. Glad you had a good clear out of all your clothes, Im sure you feel so much better for it! these look amazing. I'll have to get my hands on those hershey drops! I just threw away a TON of clothes I was hanging onto for the same reason : ( Lovin the cookies! They sound amazing!! My mom-in-law tried your recipe and I really liked it! It's sooooo yummy!!!! These look amazing! 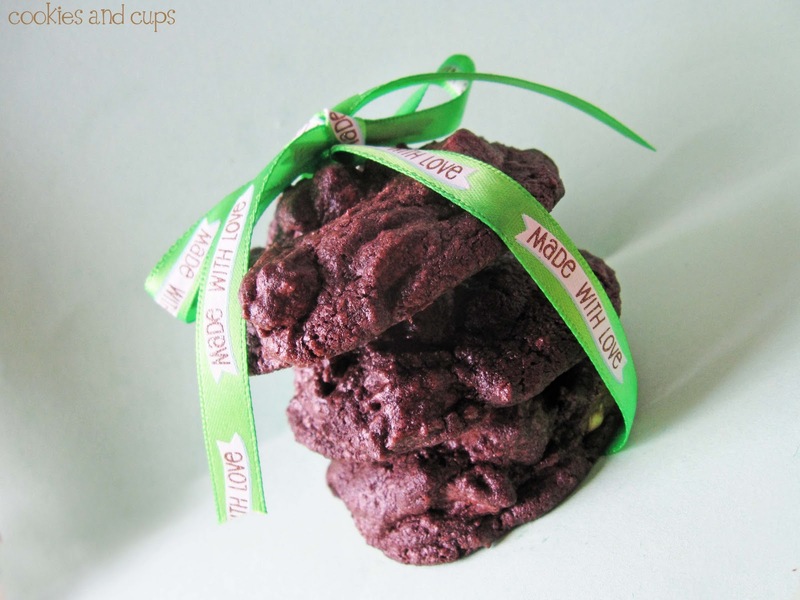 Here is a recipe for some cookies i love -http://allrecipes.com/Recipe/Chocolate-Sandwich-Cookies-II/Detail.aspx – these are cake mix cookies! They are delicious and l hope you enjoy them! But you should know that you can use any flavor of cake mix, and also, this recipe makes a double batch, so if you are only making 1 batch you will need to use only half of everything. Thank you for sharing this. (Both the recipe and your personal story). I know how hard it is to be so public about a rough relationship and to try to keep food and relationships separate. The cookies look delicious and I am looking forward to trying them. “1 1/2 t. pure vanilla” — is the ‘t’ tablespoon or teaspoon? Plus, I loved your post–it was so cleverly written! If only I weren’t trying to lose weight. This site makes me hungry! It’s bringing out my inner child. Great job.